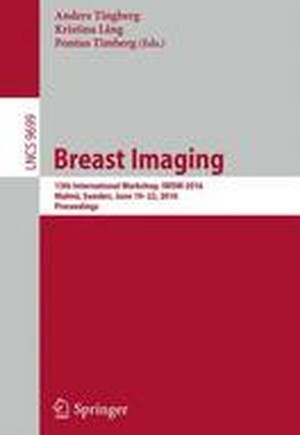 This book constitutes the refereed proceedings of the 13th International Workshop on Breast Imaging, IWDM 2016, held in Malmo, Sweden, in June 2016. The 35 revised full papers and 50 revised poster papers presented together with 6 invited talks were carefully reviewed and selected from 89 submissions. The papers are organized in topical sections on screening; CAD; mammography, tomosynthesis, and breast CT; novel technology; density assessment and tissue analysis; dose and classification; image processing, CAD, breast density, and new technology; contrast-enhanced imaging; phase contrast breast imaging; simulations and virtual clinical trials. Screening.- CAD.- Mammography, Tomosynthesis, and Breast CT.- Novel Technology.- Density Assessment and Tissue Analysis.- Dose and Classification.- Image Processing, CAD, Breast Density, and New Technology.- Contrast-Enhanced Imaging.- Phase Contrast Breast Imaging.- Simulations and Virtual Clinical Trials.